There’s something to be said for second chances. They’re great for righting wrongs or attempting the previously untried. Consumer Guide® got a second chance to drive the new Audi Q7, which has been completely redone for 2017. For this driver it offered the opportunity to use the premium-large sport-utility vehicle differently than he did the first time and learn something new about it. 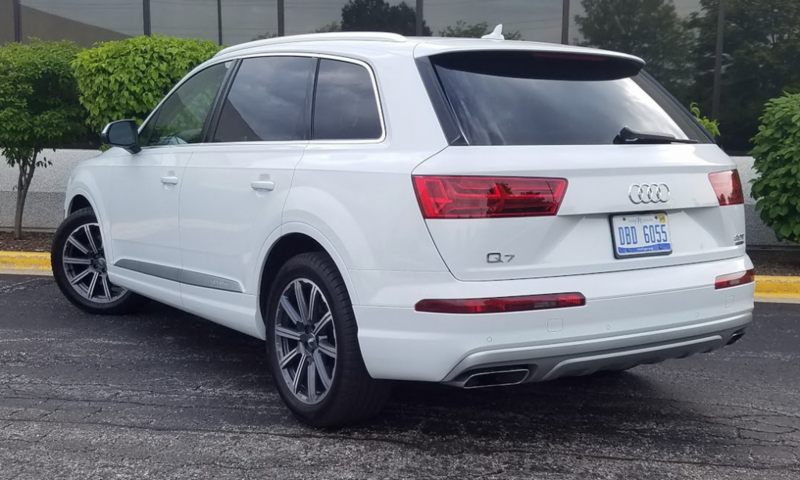 All Q7s come standard with a power liftgate. The Prestige package adds 20-inch, 10-spoke alloy wheels. Here’s where that second-chance business comes into play. In the previous Q7 test, this reviewer basically commuted to work on often-sluggish Chicago expressways. Alternating between acceleration-altering “Comfort” and “Dynamic” driving modes (and often disabling the stop/start feature), he recorded a substandard 17.94 mpg from a 184.3-mile stint composed of 75 percent city-type driving. This time, though, the commuting was augmented by a run to a resort town on the “west coast” of Michigan that added a lot of open-road driving. 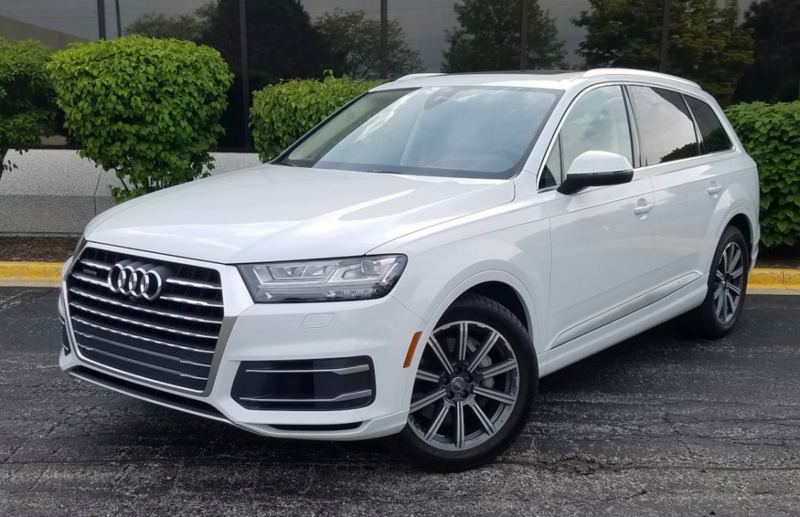 Operating solely in Comfort mode for 446.2 miles, just 27 percent of which were in city conditions, the Q7 made a commendable 22.93 mpg. The whole test was done on a single tank of premium gas. At its peak on the Interstate, the current average reported on the vehicle-information display was closing in on 29 mpg, and the truck’s own calculations suggested that a bit more open-highway driving would have extended range to more than 500 miles. The Q7’s cabin boasts a classy, sophisticated look, with excellent materials and assembly quality. The first and second rows are spacious for most adults, but the third row can be cramped for large passengers. Out where the traffic is light, the supercharged V6 makes the Q7 a swift, smooth, and fairly quiet roadrunner. Picking Comfort from the menu of “Drive Select” settings also influences suspension behavior, which is a bit softer than in Dynamic, and the test vehicle was outfitted with the adaptive-chassis option that includes four-wheel steering and an adaptive air suspension. Road bumps were more often heard rather than felt, the Q7 stepping over them smartly and rebounding quickly. Handling ease belies this Audi’s size. A windswept return trip from the Michigan overnighter only occasionally knocked the Q7 off course but a bit of wind noise did make itself heard in what otherwise is an impressively quiet cabin. This driver never has been a huge fan of centrally controlled infotainment systems like Audi’s MMI. They almost always seem to complicate what should be simple tasks. However, heading out of town practically demanded sampling the standard navigation system. Manually inputting a destination address on the display screen that powers up from the top center of the instrument panel is easy enough, and the system had a nice habit of automatically jumping from a big-picture view when covering open-road miles to a more localized focus around significant route changes. When navigation is on, the center of the tachometer dial presents a countdown of miles to destination and estimated time of arrival. The Q7 offers a so-so 14.8 cubic feet of cargo room behind the third-row seats, but that number grows to a cavernous 71.6 cubic feet when both the second- and third-row seats are folded to create a large, level load floor. The Pistachio Beige leather seats provided excellent long-distance comfort for passengers in the roomy front and middle rows of the 7-passenger Q7. Rear cargo room is fairly limited with the third-row seats up—a couple of overnight bags placed lengthwise pretty much took up the available floor space. However, with the rearmost seats lowered there was considerably more space for items picked up on the trip. (The seats power down via button controls built into the left sidewall.) If you need even more room, the 40/20/40 second-row seats drop to create a unified, flat load floor. A Q7 becomes a Prestige when it is equipped with a $9500 Prestige package. 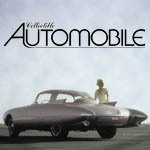 (Base price is $54,800; the test vehicle topped out at $74,825 with all options and delivery.) The Prestige group consists of 20-inch bicolor alloy wheels, all-season run-flat tires, Bose surround-sound audio (superseded by the stellar $5000 Bang & Olufsen system in our tester), head-up display, LED interior lighting, Vision package (LED headlights, a top-view camera system, and Audi’s “virtual cockpit” that fills the 12.3-inch instrument-display area with a panoramic 3D-like map while the depictions of the gauges migrate to the corners), Warm Weather package (four-zone automatic climate control, aluminum-optic diffuser-vent trim, four-way power lumbar adjustment for front seats, ventilated front seats, and manual sunshades for second-row doors and the rear window), Audi advanced key, enhanced navigation with MMI touch that incorporates handwriting recognition, Audi connect information and emergency-service links, smartphone integration including Apple CarPlay and Google Android Auto, “side assist” with “pre sense rear” (including rear cross-traffic alert and vehicle-exit assist), and a power tilt/telescoping steering wheel. At the Prestige level, the Q7 starts to become an expensive proposition. However, a lot of its best bits can be found further down the line. Indeed, its quattro all-wheel drive, panoramic two-panel sunroof, and leather upholstery are standard in all models. This second-chance drive didn’t cause any second-guessing of the good job Audi has done with the new generation of its biggest SUV. Even in optioned-up topline form, the Audi Q7 is more affordable than most of its premium large SUV rivals, and notably less “blingy” as well. It also offers sharper handling and a more engaging on-road driving personality. Written by: The Daily Drive staff on June 15, 2017.on March 22, 2019.